What are Your Favorite Diamond Cuts for Eternity Wedding Rings? Home » deBebians Fine Jewelry Blog » What are Your Favorite Diamond Cuts for Eternity Wedding Rings? There is no piece of jewelry that is quite as striking as eternity wedding rings. What kind of diamond cut is your favorite for this romantic type of jewelry? 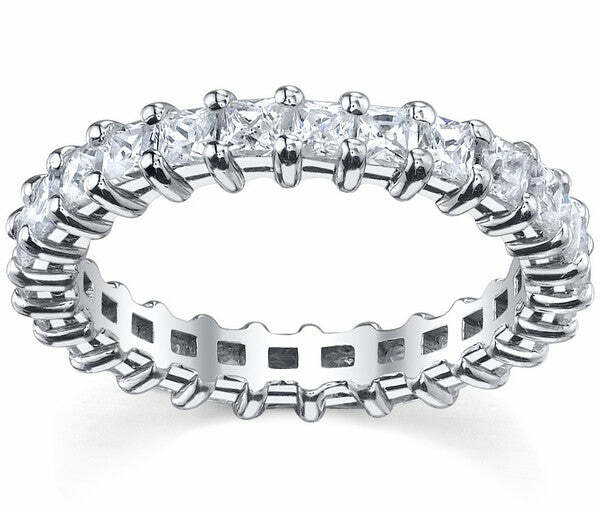 The princess cut eternity band is a favorite style among women. This ring features princess cut diamonds the entire way around the ring. The never-ending diamonds is symbolic of eternal love and the continuous journey that a couple takes together. The princess cut diamonds make one of these rings incredibly beautiful and unique at the same time. Many women love the look of these diamonds because they are not overly feminine and are a nice alternative to round brilliant diamonds. A princess cut eternity band has become a popular choice for a wedding band or anniversary ring. Leave a comment to tell us what kinds of eternity wedding rings you own and what kind of eternity wedding rings are your favorite styles.